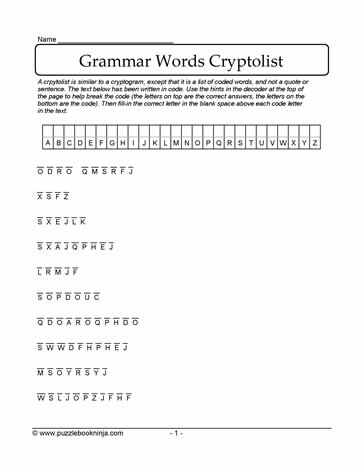 Grammar words cryptolist puzzle. Students need to decode the letters by substituting one letter for another. The table helps to keep track of the letter substitution. Problem solving skills engage students' knowledge of: letter pattern sequences, common letter patterns and knowledge of grammar vocabulary. Encourage students' problem solving skills for academic vocabulary building. Suitable for students in homeschooled students as well as students in the middle grades 7,8,9. Home schooled students will also benefit from this vocabulary building and decrypting challenge.